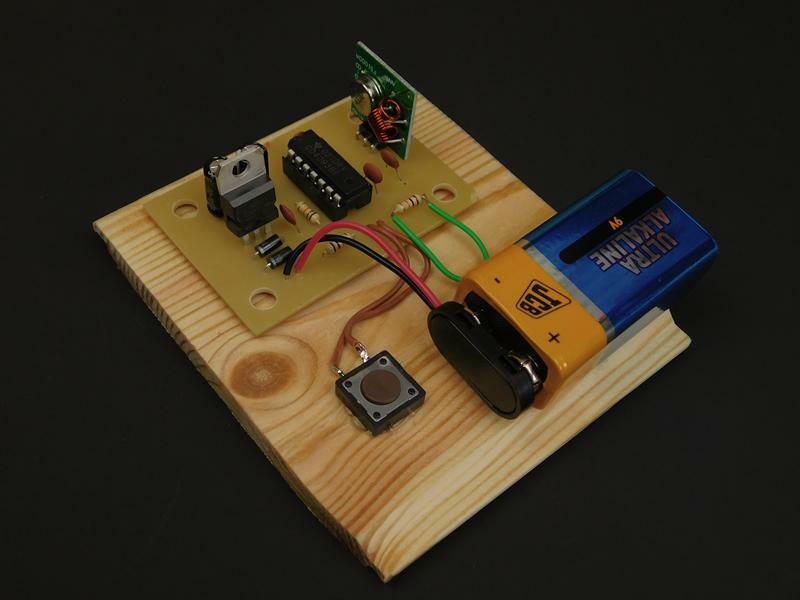 Learn how to create a Morse code system you can use to communicate with others over a distance. Morse code has its origins back to the first telegraph as a method for communicating. Since the only data that could be transferred was either the presence of electrical current or not, all letters and numbers were encoded in such a way that all could be interpreted with either a long pulse or short pulse. In this series of projects, I will show you how to create a Morse code system that you can use to communicate with others at distance! This project will start with the most basic of systems and you will transmit Morse code via a switch and a transmitter/receiver pair. How Does the AM Transmitter/Receiver Work? The heart of both the transmitter and receiver is the use of premade modules that help dramatically. The reason for using premade modules is due to the difficulty in getting radio transmitters and receivers at that frequency to function correctly. Some problems that can occur include incorrect inductor sizes, PCB tracing issues, proven circuitry, and tuning. 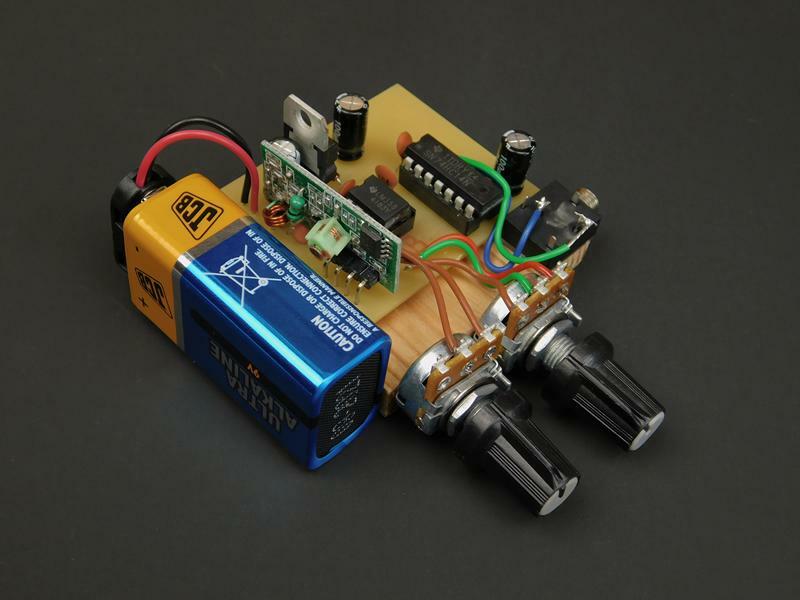 The transmitter itself consists of a switch, a 4093-based oscillator with enable, and the 433Mhz transmitter module. If the switch is open, then the NAND gate U2D outputs 0V which in turn feeds 0V into one of the inputs to the NAND gate U2B. U2B is configured as an inverting Schmitt trigger oscillator where the frequency of the oscillator is determined by the size of C5 and R2. Increasing the value of either of these components decreases the output frequency of U2B and in this circuit, they have been chosen to produce an audible tone near 500Hz. But for the oscillator to oscillate it requires its second input to be connected to VCC and so when the switch is pressed, U2D feeds a voltage of VCC into the second input of U2B. When this happens, U2B outputs the 500Hz tone into U2C and then into the data input on the 433MHz transmitter. So, to summarize, when the switch is not pressed the transmitter transmits nothing and when the switch is pressed it transmits a 500Hz tone. The receiver consists of a configurable Schmitt trigger input, an inverter, and output buffer. 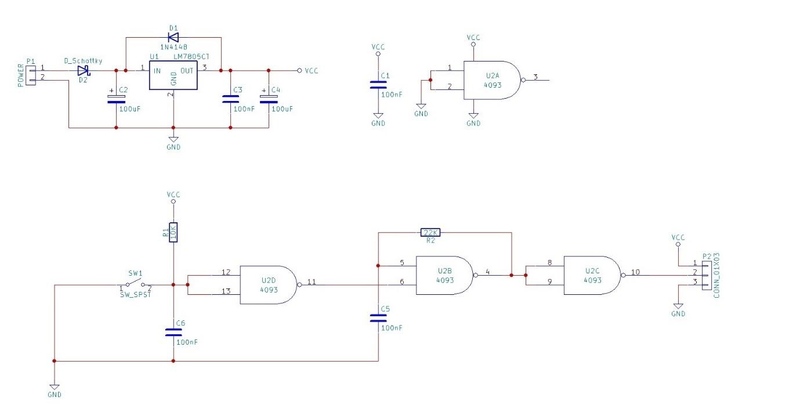 The input Schmitt trigger that takes the signal from the receiver module is used as to prevent noise on the input (RV1 and RV2 can be adjusted to give a clean signal from the receiver). The signal is then buffered with U2B to improve output impedance and this buffered signal is finally fed into a basic driver consisting of U1A, U1B, U1C, U1E, and U1F all in parallel to improve output current capabilities. The final output is fed into C1 to remove the DC offset so the signal can be fed into headphones. Like all electronic projects posted by myself, this circuit is ideal for most circuit construction techniques. These include the use of a custom PCB (design files provided), stripboard, breadboard, and for those who are feeling adventurous, point-to-point. When building this project, the application that the circuit is used in should be considered. For example, if the objective is to have the transmitter/receiver portable, mount the circuit on a single board and use a project enclosure. Powering the circuits can be done with any voltage source about 6V and lower than 30V. The project built here uses 9V batteries that fit nicely to the side of the project base. You can find a downloadable version of the project files here.